This is part two of a story written by Jamie Colen for this web site. Jamie is restoring an antique Comet Motorscooter that has been in his family for years. The Comet Motorscooter was built pre-WW2 in Minneapolis, MN, with at least three models available. Jamie is restoring the open frame Sport model with a bicycle seat. Part One is a very nostalgic story about this little scooter with pictures of it in its un-restored condition. A later story will show the results of the restoration. 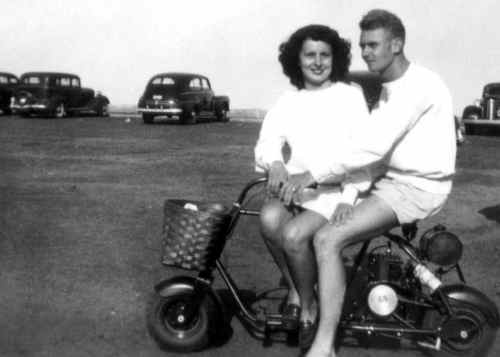 Please see the black and white photograph below of my Mom and Dad riding the scooter during the summer of 1946. (Incidentally, this is my favorite photograph of my parents as well!) This was shot at North Beach in North Hampton, NH and is one of only two images that I know of from the scooter’s early days. My Dad had just returned from WW II, where he had been stationed on the Aleutian Island chain in Alaska as a “fly boy” like so many millions of people, but that’s another story. This photograph holds some odd mysteries that I am trying to unravel: 1) It looks like the fuel tank is much bigger than the one that it has presently? 2) Is that a (gasp) chain and sprocket for the drive system? (There has always been a fan belt since we all remember it) 3) The foot peg bar looks like it’s mounted on the top portion of the down tubes, where now it is now on the bottom. (The present weld look like factory quality and match the rest of the frame welds)? 4) There is a strange air cleaner/breather system coming out from the left side of the engine wrapped in some kind of gauze. 5) There is an oil fill/drain on the lower forward section of the engine that does not mesh with the look of the engine now. All of these oddities beg many questions. I invite the readers and scooter enthusiasts to please shed some light as to what this picture may be showing. I have asked my Father about these anomalies, yet he does not remember any modifications or changes since his Mother (my Grandmother) bought it. It is agreed and supported however, by various paint chips, that the scooter was originally red. The exact color has been matched and presently being completed at the paint shop. While I am waiting to pick up the frame, I am trying to piece together and take stock of the remaining parts: I collected the two remanufactured (original ones were missing) seat brackets from the blacksmith, they tighten up nicely and squeeze against the seat post very well. I still continue the search for the original air breather and the mysterious throttle assembly. I do still have the original owners manual for the Clinton 701AS engine, with many great photographic details of the various applications and clutch setups that this model engine may have been used for, including a generator, lawn mower, etc. Some of these illustrations show the entire linkage in great detail, so I may have a metalsmith make the missing parts if I am unsuccessful in finding the original ones. My older brother Steve did do some work on the scooter when he was a kid, circa 1965-6) so he is now the greatest source for figuring out how the throttle cable attached to the carburetor, with the associated linkage in conjunction with any governor device it may have had. He will take a look at it when the engine gets mounted to the frame. I have discovered that the brake and accelerator levers were originally welded to the handlebars, but I have little evidence of what they looked like. For now I have a set of brake levers from a late fifties Raleigh bicycle that I will use. The engine is mounted to a sliding adjustable tray that is then bolted to the frame by means of four clamps. This entire tray than can be moved forward or back to facilitate the tension of the drive (fan) belt. There are some indications by means of a dent in one of the upper frame tubes that the spark plug comes very close to the metal if too short of a drive belt is used, thus shorting out on the frame. The original four mounting bolts for the engine are accounted for, but the rubber mounting grommets are severely deteriorated. I found some silicon replacements at the hardware store that are close matches, I hope they will fit. On one Saturday morning, I decided to rig up a temporary fuel line to the sediment bowl and get the engine running and tuned properly. I realized after a few minutes that this engine floods very easily! There is a fuel flow thumbscrew within the sediment bowl assembly that allows fuel from the tank into the line to the carburetor. I found that this screw, as it’s being withdrawn from the stop is very sensitive. Only a half to three quarters of a turn is all that is necessary to facilitate fuel flow. The mixture screw on the Tillotson carburetor is also very delicate in dictating the fuel air mixture and for that matter, the graduation from idle to operating speed of the engine. These old cast iron engines have comparably very low compression to those of today, so once flooded, you just need to wait a while before you can re-start it. As with any hobby or project you learn very quickly about the coveted, important gift of patience. With patience on your side, as I have come to know, anything is possible. Having owned and worked on air cooled Volkswagens almost my entire adult life and like most everyone who has immersed themselves in caring for old VW’s to any degree, I have read the great John Muir ‘Idiots Guide”. This was a groundbreaking book by a man who was not only a great mechanic and philosopher, but also a wonderful teacher. He demonstrates by feel and sound. He often states in his book, “When you strip a thread, snap a stud, skin your knuckle, drop a nut into the engine or the like, don’t blow your top. Instead - stand up, move away, breath and relax, admire the beauty of the machine”. Yes, this is hard to do when in the throws of the aforementioned situation, but it really works! Believe me, I have had a lot of practice! OK, the frame is back from the paint shop. Please look forward for the photographs of the finished frame before assembly. The original rubber handlebar grips are in great shape, as are the foot peg pads. It amazes me though, how some rubber pieces, like the engine mounts, once in contact with oil, really got eaten away quickly! The tires are passable, but I think I will need to replace them eventually. In assembling the fuel tank to the frame with the brackets, I think I will need to use rubber gaskets, as to not mar the paint. (Some scooterists have suggested that Comet may have originally used cork?) In replacing stripped or missing hardware, I think I will use stainless parts… any suggestions?